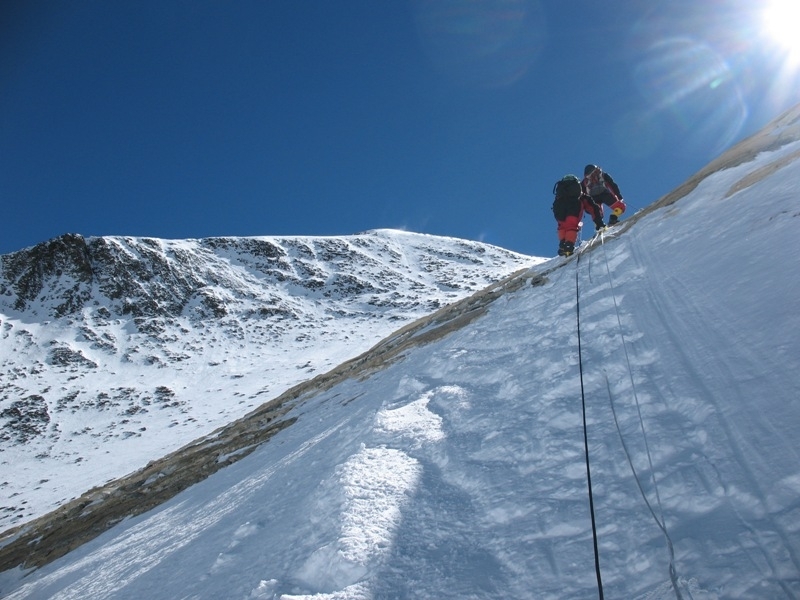 Camp III, The Geneva Spur — We're going to climb Mt. Everest. Come Join Us. Camp Three is a small ledge on the Lhotse rock face at 7,470 m (24,500 ft). It is maybe 150 feet of very steep black rock, ice and snow. Actually, Camp 3 is any spot flat enough that you can pitch your tent. There are numerous ‘Camp 3’s.’ The space is so small and the Face so steep, we will stay If it weren’t for exhaustion and thin air, it would be difficult to rest. At this campsite we will remain connected to the safety lines throughout the night. From Camp III the next day, we’ll continue to traverse the ice wall towards the Yellow Band landmark which is clearly visible above just below the ridge between Mt. Everest and Lhotse above. The band is made up of metamorphic rocks, including epidote, which appears to be different colors when viewed from different angles. One of those colors is the yellowish-brown seen on this section of the mountain. The epidote contains some marble, which also weathers into the distinctive yellow tone. More interesting is the fact that marine fossils have been found embedded in this section. But at 25,000 feet and after weeks of climbing, we’ll probably not have the stamina to look for fossils as we carefully cross this rocky section. Above the Yellow Band we’ll approach the Geneva Spur, an outcropping just below Camp IV, blocking our way to the summit. We’ll work our way up the couloirs beside the Spur, which can be seen to the left above, reaching down the snowfield from the ridge line. It sounds easy to cross a snowfield, but we’ll need to be prepared for dangerously high winds, or believe it or not, scorching temperatures from the sun radiating off the snow and of course the ever-present risk of avalanches. Old and new ropes will be in place to cross these fields. We’ll check them for wear and then turn our attention to rock falls from other climbers traversing above us. It seems hard to believe that the distance from Camp III to Camp IV, our work for the day, is only 500 meters. The last traverse will land us at the foot of the last wall where we’ll enter the land of the spirits – the Death Zone.